Inspired by many other public syllabuses such as the #FergusonSyllabus, #CharlestonSyllabus, #StandingRockSyllabus, and others, I decided to create a “syllabus” (more like a generic reading list) of Anishinaabe Studies. This was, in part, an experiment I have wanted to do for a while, in response to a number of academics (including some Anishinaabe scholars!) who told me there wasn’t enough material to claim the existence of Anishinaabe Studies as a field. There are, as of August 15th 2018, over 80 different books (plus a few articles) on this list, most of them by Anishinaabe writers. This doesn’t even begin to touch the vast amounts of Anishinaabe writing that is not in the form of book-length scholarship. This list is very much a work in progress and I welcome additions and suggestions! Many sections are particularly incomplete, like the history sections and the gender/sexuality sections. And since I’m only one person, I’m sure my biases show (there is a lot of Wisconsin/Minnesota Ojibwe material, which is just because that’s where I grew up and what I know). Please note that I have not read everything on this list and can’t vouch for all of it being perfect. I offer it anyway with the idea that most of it, hopefully, is worth engaging with. In addition, I hope to make a version of this at some point specifically focusing on non-scholarly material and things that can be accessed for free–but I am also a student about to start the school year, so that may be a ways off. Note: I have chosen to use Anishinaabe as a catch-all umbrella for those Native people who speak a variety of the language known as Anishinaabemowin, or who are citizens of a nation that was part of the Three Fires of Ojibwe, Odawa, and Potawatomi people. Please correct me if I have mislabeled anyone’s identity. I have tried to include authors’ tribal affiliation where applicable; Anishinaabe authors are identified by their band or tribe alone in most cases. Lead mining and the lead rush of the 1820s is a huge part of the cultural narrative of white settlement in southeastern Wisconsin and the nearby parts of Minnesota, Illinois, and Iowa known as the Driftless Area. It’s the quintessential frontier story: white American men discover a mineral resource and flood the area, doing the manly work of mining while they slowly civilize the area for further settlement. But the idea that there was this untapped mineral waiting to be found by Americans is almost entirely wrong. For nearly a century before that, the lead mines had been worked with increasing intensity–and not just by Indians, but by Indian women specifically. Indigenous people had been mining for lead in small quantities for thousands of years, but it was the arrival of the fur trade and especially the firearms it brought that sparked more heavy mining by Ho-Chunk, Sauk, and Meskwaki people–an American trader predicted that in the summer of 1826 the Meskwaki would raise between 600,000 and 800,000 pounds of lead at one of their key mining sites. Having learned to smelt from early fur traders, they used the mines to make lead balls for their guns. This had two benefits: it provided an alternative trade good to furs (which could vary greatly in number and quality depending on the year), and it lessened their need to purchase musketballs from the traders. This process was highly gendered. The actual creation of ammunition was primarily men’s work, but mining itself was overwhelmingly dominated by women, with only a few elderly men participating. Indigenous women in this area were considered to have domain over the farming fields and the sugar bushes, and the mines may have been an extension of this. Like sugar-making, mining was probably a seasonal activity incorporated into the cyclical yearly activities. Women would dig square holes and dredge up the rock and ore, then broke up the deposits by heating them and dousing them with cold water before smelting the lead in furnaces cut into hillsides. Evidence suggests that indigenous women may have had very strong proprietary feelings about the mines. As Creole communities of mostly French Canadian and mixed-blood people sprang up in the Driftless Area (such as in Prairie du Chien), only men who married Native women were permitted to even see the lead mines. One man, Julien Dubuque, was unusually granted permission to work the mines after marrying a Meskwaki woman, whose name has unfortunately been lost in the records. The work of Monsieur and Madame Dubuque expanded the mining operations by encouraging a developing Creole community that bought Indian lead in exchange for trade goods. According to Ho-Chunk sources, indigenous miners also sold musketballs to other tribes outside the region. After the War of 1812, the American military established a more permanent presence in the region. At first, immigrating American men had to follow tradition and marry indigenous women to get involved with mining. But by the late 1820s thousands of white miners and a smaller number of black miners (both free and enslaved) had rushed to the area. The two groups of miners rarely mixed, clashing over gender roles, language, and prejudice. Worse, white men engaged in rowdy behavior, and indigenous women, who had occupied crucial positions in society until now, were abused so frequently that Indian men began to try to police them. In Prairie du Chien, the predominately metis society passed a law prohibiting “white persons skulking” around after dark. The white miners’ abuse of Indian women, their destruction of indigenous food sources, and their relentless incursions into Indian territory were major issues for indigenous communities by 1830. Meanwhile, changing circumstances meant that women’s production of lead and maple sugar were now more central to indigenous economies than the fur trade, leaving men idle and susceptible to drunkenness and belligerence. These strains, along with longstanding conflicts over certain treaties, contributed to the outbreak of the Black Hawk War in the 1830s. The war tore apart Indian communities and increased white fear and hatred for Indians, resulting in the policies of removal that were attempted in the next few decades. The Sauk and Meskwaki were removed several times to Iowa, Kansas, and Oklahoma. Some remained hidden in Iowa until they were allowed to purchase their own land in 1851, which they still own today as the Meskwaki Settlement. The Ho-Chunk were also removed repeatedly, to Minnesota, South Dakota, and Nebraska. Though some still live on the Nebraska reservation today, many Ho-Chunk people refused to leave their Wisconsin homeland, even walking back all the way from Nebraska. Today they have begun to reacquire their land in southeastern Wisconsin. For more detailed information on this subject, see Economy, Race, and Gender along the Fox-Wisconsin and Rock Riveways, 1737-1832 by Lucy Eldersveld Murphy. I’ve been reading a lot of accounts recently that argue indigenous people asserted much more control over many areas of the continent into the 19th century than modern people usually assume (check out The Native Ground by Kathleen DuVal or An Infinity of Nations by Michael Witgen, not to mention Hamalainen’s Comanche Empire) and I got to thinking about the response my post about the teaching of Native history received. One of the most common responses was along the lines of “Well, Native Americans didn’t contribute much to history anyway, they didn’t do much important, it’s sad but they were basically just wiped away by Europeans.” There is an incredible amount of hindsight bias in that kind of thinking. When you are living in a society in a time where Native people have been very carefully thrust out of view, it is easy to see the dominance of European-descendants as an inevitable, steadily progressing event. Manifest Destiny was always propaganda, and it has done its job beautifully. Meanwhile, more and more historians and indigenous people at large are making powerful, nuanced demonstrations of how that view is not just a product of hindsight bias but also flatly incorrect for many parts of the continent. Others have shown how the “forgetting” of the impacts of indigenous people is part of a very deliberate political strategy in the creation of the US nation-state. Yet still both laypeople and academics are skeptical that indigenous people had any impact on the history of the Americas besides in their legacy of disappearing. Why? I’m starting to think it has to do with what I’m calling “two-sentence history.” Or maybe “textbook history” might work, too. A great deal of people do not seem to believe history matters unless you can explain it to them in about two sentences. Or that history outside of what would be taught in a grade-school textbook is not worth bothering with. A number of people in my earlier post pointed out that even European history is pretty shoddily written in textbooks–which is true, though it still gets a better deal than non-European history. Textbooks have historically been written with particular goals of providing an easy-to-follow and patriotic nation-supporting narrative. It’s not necessarily bad that textbooks are a specialized kind of writing–every kind of writing has some specific purpose. But too many people seem to have the attitude that any history more in-depth than that is pointless. Note that the holder of the Two-Sentence View doesn’t just want you to be able to explain what happened in two sentences. No, you also have to be able to explain how and why what happened is of tangible relevance to Two-Sentence Viewholder right now. And then add in that what is considered “relevant” is largely determined by the narrative the viewholder was fed whenever they attended school. It’s basically a self-perpetuating cycle, with only the two sentences in their grade-school textbook ever being accepted as valid. Any new views of history are basically impossible to introduce with that sort of mindset. This is all part of a bigger issue: why study history at all? The importance of history itself, any history, is increasingly challenged in the United States. “Why history” is an enormous question that people more thoughtful than me have answered, and I’m not going to try to do so. But if even mainstream history is being questioned, then the history of those seen as unimportant–such as indigenous people–doesn’t even have a chance. This blog post was written for tumblr user howoddnichole, who requested some information about Kaskaskia history. Most of the information comes from Richard White’s The Middle Ground, Wayne C. Temple’s Indian Villages of the Illinois Country, and the Peoria Tribal webpage. The Kaskaskia people were one of the primary tribes of the Inoka (Illinois) Confederacy of the 1600s and onwards. They were one of the Algonquian peoples attacked by the Haudenosaunee in the 1600s Beaver Wars, forcing them to take refuge in Wisconsin and Illinois. In the mid-1600s, refugees from a variety of tribes lived in multitribal villages, and it was probably around then that people of similar languages formed the Inoka Confederacy, with large numbers residing at a place called Starved Rock. The conditions people lived in were hard, as corn often failed and hunters competed intensely for game. In 1680, the Haudenosaunee started another wave of attacks, destroying the Kaskaskia Great Village. This sparked an initial Algonquian-French alliance, and the French began to maintain posts at Starved Rock, where a large number of Kaskaskia resided. Along with them came large numbers of missionaries. Among the people of the Inoka Confederacy, young women in particular were attracted to Christianity and the cult of the Virgin Mary. In some ways, it had a similar function to a women’s religious society by providing them with a source of validation for power. Other women married French coureurs de bois, creating formal trade relationships through marriage, which ultimately led to the French essentially freaking out about miscegenation and removing all their western posts. In 1694, a Frenchman named Michel Accault tried to get married to a devout Christian Kaskaskia woman who was also the daughter of a chief, Aramepinchieue. Her father wanted the marriage to happen to strengthen the trade ties, but Aramepinchieue refused, drawing on both Kaskaskia ideas of sexual sovereignty and Catholic notions of piety. Her father ejected her from his house and tried to stop the church services; she and fifty women persisted, defying the male authorities. Eventually they compromised, and the two were married and Aramepinchieue’s father agreed to let the priests in, resulting in the Kaskaskias becoming almost universally Catholic, at least in name, by 1711. The Inoka confederacy was also engaged in long-term war with the Meskwaki nation, and they allied with the French to nearly destroy the Meskwaki in the 1730s. It may have been due to these wars and disease that during the 1700s the population of the Inoka declined significantly. The Kaskaskia resettled from Starved Rock to the place where the Kaskaskia River meets the Mississippi, where they continued to intermarry with Frenchmen. Their relationship with the movement led by Pontiac in the 1760s was touchy, and ended with Pontiac being killed by some Peoria for an attack he made on an Inoka chief. 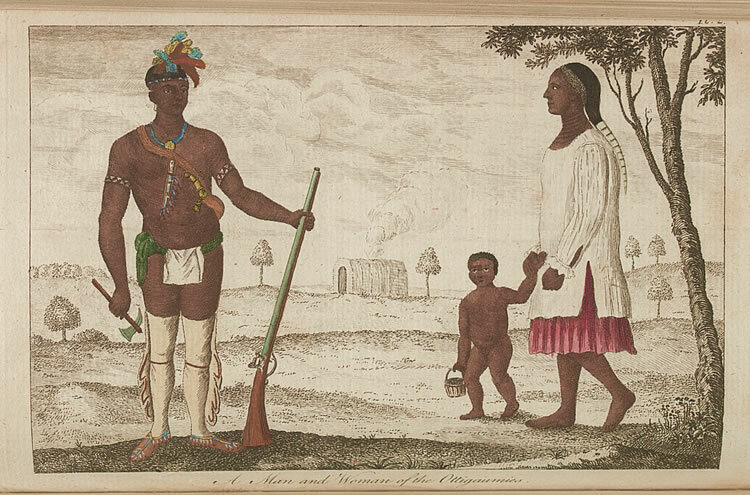 By the time of the American Revolution, the Kaskaskia had mostly relocated to the Mississippi, but a group of them, along with other Indians, allied with the British and moved into the Ohio country to attack the Americans to prevent their entrance into the area. By the late 1700s, the Inoka confederacy’s population was devastated, and the United States negotiated a treaty with them at Vincennes in 1803 in which the Kaskaskia ceded their territory in Illinois Country and received two reservations. In 1832, the remaining Kaskaskia signed a treaty leaving Illinois and Missouri to settle with Peoria, Piankeshaw, and Wea in Kansas, with whom they officially formed the Confederated Peoria tribe in 1854. After the Civil War, most signed the Omnibus Treaty to relocate to Indian Territory, while some remained and became US citizens. The Dawes Act of 1898 divided the Peoria’s land into allotments and dissolved the traditional government; this was reinstated with the Oklahoma Indian Welfare Act of 1939. In 1959, the Peoria tribe was terminated, and achieved federal recognition once again in 1978. Here is an interesting story I’ve run across a few times. Don’t consider this exhaustive research on the subject, but it’s something I thought was worth putting on here. On Wikipedia, Charles Lippert spells her name as Aazhawigiizhigokwe and translates it literally as “Goes across the sky woman.” I know a lot of people are freaked out by the whole concept of Wikipedia because any fool can put whatever he wants on it. Me, I look at 95% of the internet that way (including this site). The important thing is the quality of the information. Lippert works for the Mille Lacs band with first-language Ojibwe speakers and has contributed to several on and offline published works. I find his transliterations to be solid.